Gear VR with Controller Transform virtual reality with a new handheld controller. Explore thousands of exciting 360° experiences. Imagine bigger Explore virtual worlds and travel the globe with Gear VR. With your phone in the headset, sit front row at the biggest events, paint in VR or just hang out with friends. And the intuitive handheld controller gives you new ways to go deeper into games and other experiences. Anything’s possible in virtual reality. More social Connect with your friends and their stories in VR. 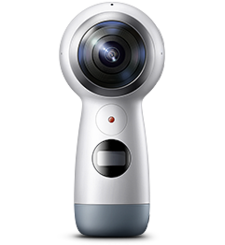 Watch 360° video captured with the Samsung Gear 360 camera, hang out with friends in Oculus Rooms or browse over a million 360° videos on Facebook 360. Power moves Use the included Gear VR controller to navigate experiences or play games. With a trigger, touchpad, back and volume keys, you’ve got everything you need to control the action from one hand. 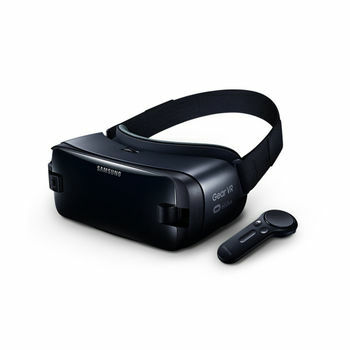 Powered by Oculus Oculus, the leader in virtual reality, brings you the latest games, blockbuster movies, as well as Netflix and Hulu shows on your Gear VR. There’s more every day in the Oculus Store. Game changer You’ve never gamed like this before. Use the handheld controller to steer VR Karts, pilot your ship in the critically-acclaimed End Space or go head-to-head with friends in multiplayer mode. There are over 600 titles to discover. 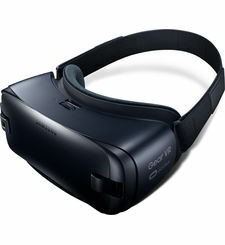 Made for Galaxy Place your Galaxy phone into the Gear VR headset to instantly go anywhere. Gear VR is compatible with a range of Galaxy devices.